Chromatized water is water that has been solarized through colored glass from the 7 colors of the visible spectrum. It has been used in color therapy to assist in healing a host of health problems. Combining color light therapy with chromatized water can have remarkable results. 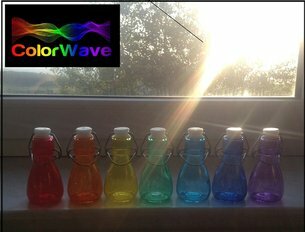 Set of colored glass bottles for making solarized water for color therapy. 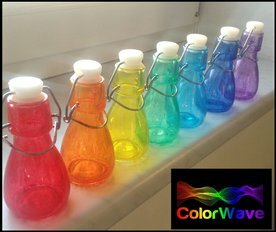 Just fill with water that has been boiled or sterilized and cooled and place on your windowsill or outside for 4-6 hours on a sunny day, any time of year. Solarized water will last for 5 days. 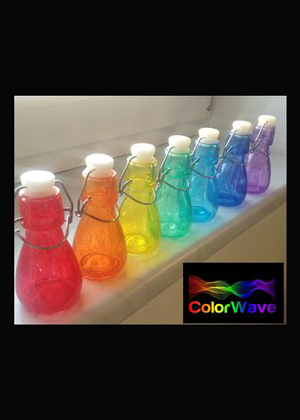 Excellent tool for color therapists to use alone or with your ColorWave Light Generator or for personal use. Makes a great gift.